I had my own commercial fishing boat many years ago when it was still something worth doing. It's a lot harder now, and a lot more corporate. The original painting Garibaldi Anne Marie is available at Art Talks Gallery in Westport Washington. There are also some inexpensive posters available at Roadside Oregon Artist Gallery.. 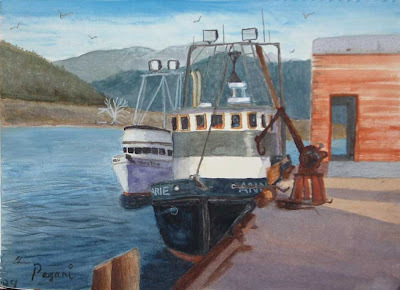 I'm reading: Garibaldi Harbor Fishing Boats (Watercolor)Tweet this!